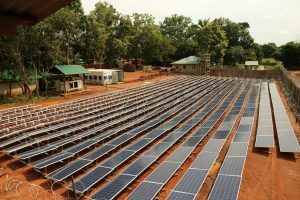 A fledgling market for commercial and industrial (C&I) solar in Sub-Saharan Africa is poised for faster growth due to high-cost and poor-quality grid power, declining solar energy costs and the rise of energy storage, according to a new report from Bloomberg New Energy Finance (NEF). The finding is significant to microgrids in the region because they increasingly employ solar as a clean substitute for diesel. 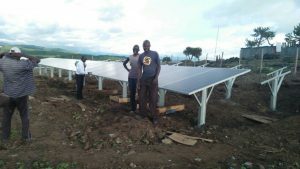 On-site solar power is cheaper than the electricity tariffs paid by C&I companies in seven of the 15 Sub-Saharan Africa markets studied, according to the report, Solar for Businesses in Sub-Saharan Africa, which BloombergNEF produced for the Swiss impact investment company responsAbility. The cost of grid power is so high in places like Nigeria that companies are investing in systems that combine solar PV and battery energy storage with diesel generators, which may be considered a stepping stone towards development of mini- or microgrids. “A combination of solar, a diesel generator and a two-hour battery can competitively displace diesel there. This is the configuration that most solar vendors in Nigeria use today to promise reliable electricity at a lower cost than what customers would spend on diesel alone. On the other hand, storage is not typically used for C&I solar in places where grid electricity is considered reliable enough, such as Kenya or Ghana. There, solar primarily competes with the grid electricity tariff, and adding storage would make it too expensive,” Kawahara told Microgrid Knowledge. Developers installed a record-high 74 MW of C&I solar PV systems, delivering electricity at rates cheaper than utility grids across the 15 Sub-Saharan countries covered in the report as of November 2018. Fifteen megawatts of C&I solar was installed in Kenya, 20 MW in Nigeria, and 7 MW in Ghana as of November, according to the report. Simple economics, as opposed to regulatory reform and state support, drives growth of C&I solar across the region, BloombergNEF explains. Battery energy storage is often required to run a hybrid, solar-diesel power system, Kawahara pointed out. Furthermore, “beyond cost savings, solar can help a business to hedge its energy costs, reduce exposure to fuel price fluctuations, and also reduce its environmental impact on greenhouse gases, local pollutants and noise,” he said. BloombergNEF expects 2019 will be another record-setting year for C&I solar in Sub-Saharan Africa. “The market has just started to emerge, but it is growing. We identified 74 MW of C&I solar in Sub-Saharan Africa, excluding South Africa…The developers we spoke with are working on a pipeline of another 110 MW to install in these countries in 2019 and early 2020, so we could continue to see rapid growth from a small base,” Kawahara said. Despite this, Sub-Saharan Africa’s C&I solar and hybrid, behind-the-meter power systems market isn’t large enough to have a substantial impact on the market for diesel generators, Kawahara added. “In Nigeria, we identified 20 MW of installed C&I solar capacity. This is tiny compared with an estimated 12.5 GW of diesel generators that were in use in the country in 2016,” he said. Banks in Sub-Saharan Africa have yet to take on a major role in providing funding for C&I solar energy systems, the report says. “So far, most business customers have bought systems for cash, without using third-party finance…With the exception of very few deals, the financial sector has largely been absent from the growth mentioned above. Most projects to date have been financed with developer equity or were structured as a direct equipment purchase,” Kawahara said. The report authors believe big opportunities exist for specialized financiers to step in and boost growth. “Installations ranging from tens to hundreds of kilowatts will likely continue to make up a large proportion of the C&I solar market in Africa. This suggests that aggregating customers is critical to finance a portfolio of projects in order to mitigate risk and raise capital to expand the C&I solar businesses. In this context, specialized financiers or intermediaries can play a role to offer debt facilities to developers,” Kawahara said. Investment funds managed by responsAbility have been financing off-grid solar projects in Sub-Saharan Africa for five years. To date the primary focus has been on residential solar, but the company expects to see growing amounts of solar power capacity installed on C&I sites, typically complementing back-up, diesel-power generation. 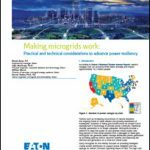 Join us at Microgrid 2019 May 14-16 in San Diego where we will announce the winners in the international “Microgrids for the Greater Good” competition. “Electricity outages are commonplace across most of Sub-Saharan Africa. 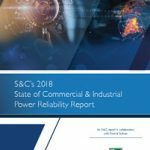 When the grid is out, customers must either shoulder high opportunity costs from lost sales or manufacturing output, or resort to much costlier back-up power, usually from diesel. This is where financing solar installations can contribute to climate change mitigation by replacing fossil fuel,” said Antoine Prédour, head of energy debt at responsAbility. Track news about the C&I solar market by subscribing to Microgrid Knowledge’s newsletter. It’s free.